There's something very Japanesque about the furniture arrangement of these Puku ottomans and Bucket coffee table below. 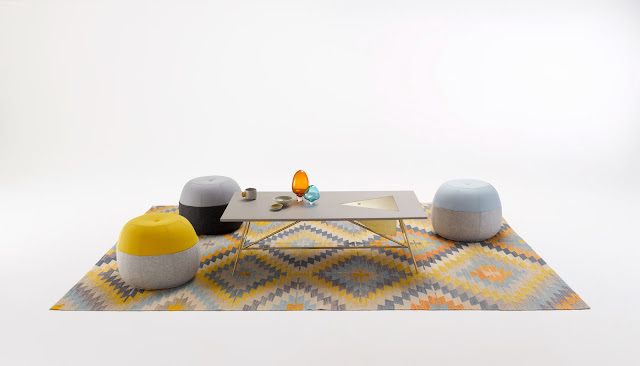 The scale and perspective is reminiscent of a kotatsu (table heater) surrounded by zabuton (cushion seats), but the truth is that this is a very Australian setting from Coco Flip, a multi-disciplinary design studio based in Melbourne. Established by Kate Stokes in 2010, Coco Flip undertakes projects within the creative fields of furniture, interior, and graphic design, including these two very recent designs. The Bucket coffee table is made from brass and cast concrete and the Puku ottoman (maori for chubby belly) are upholstered in the finest Kvadrat fabrics from Denmark. Photos: Haydn Cattach.